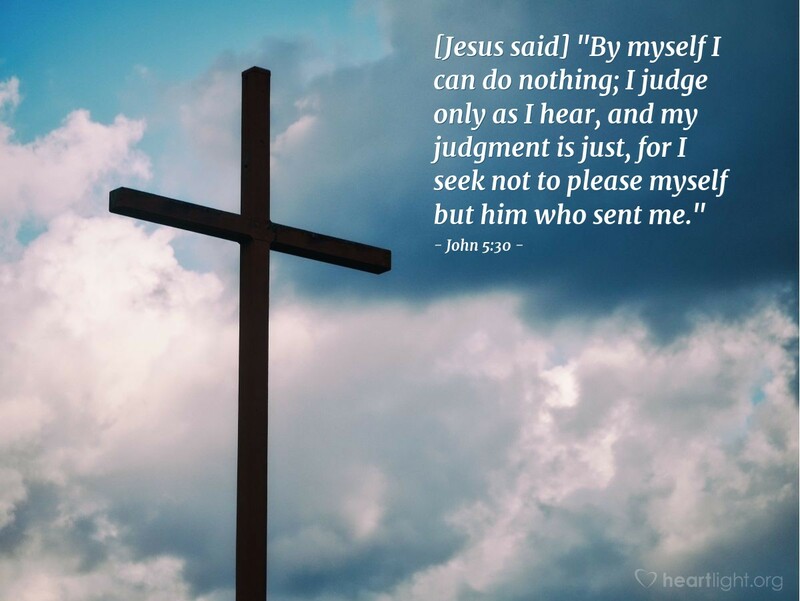 [Jesus said] "By myself I can do nothing; I judge only as I hear, and my judgment is just, for I seek not to please myself but him who sent me." "So who you tryin' to please, anyway?" These words of my dad still ring in my ears. His point? There are only two we MUST please: (1) our Father in heaven, because all praise and honor is due to him, and (2) ourselves, because we want to know that we've done the best we could do and been the best we could be. But I guess I've learned over the years that I can't begin to do the second of those very well without seeking the first one. Don't you hope that someday you reach the place where you can join Jesus in saying with absolute assurance: "I seek not to please myself but him who sent me!" The closer we approach that reality, the more we realize that we can't do anything of eternal significance on our own. Only when we live to honor God do we find the significance and have the impact that our lives were made to have. Almighty and Righteous Father, I know that without you I can do nothing that is of lasting significance. I have tried my own way and failed. I have sought my own good and seen my success short-lived. I want to live now, today and the rest of my life to please you. As I do this, I am confident that you will provide what I need and that you will empower me to do what you would have me do. In Jesus' name I thank you. Amen.